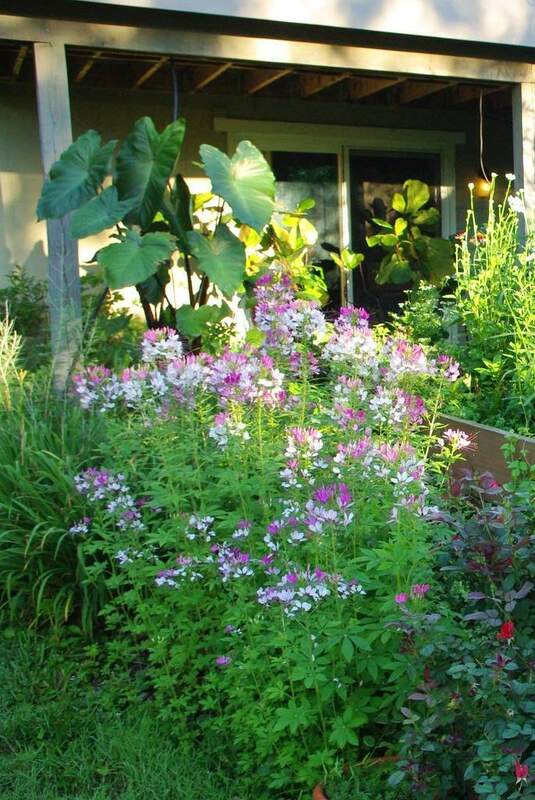 I've grown Cleome mixed in with other plants before, and have always wanted to see what it would look like in a mass planting on its own. This is not a huge bed of them, but it still looks pretty amazing. Gives the bees a bigger target too. So, the bees. 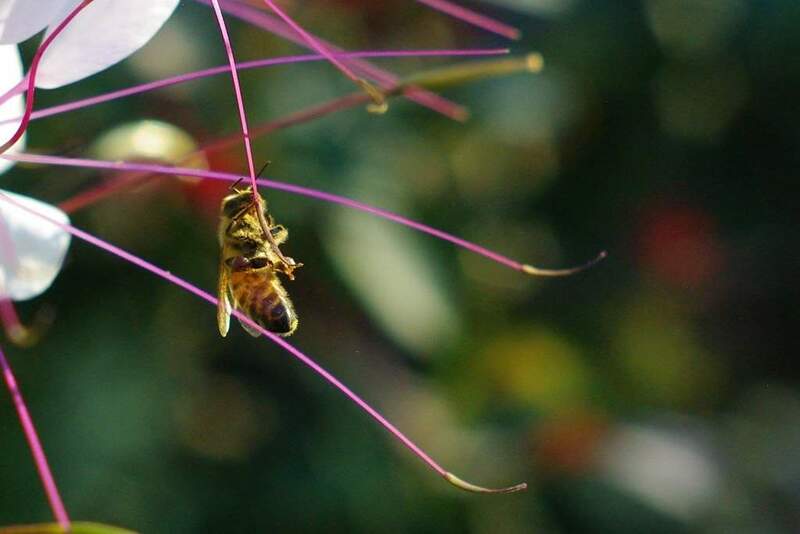 I like almost any plant that attracts bees, and I'm always happy to see them happily buzzing around. 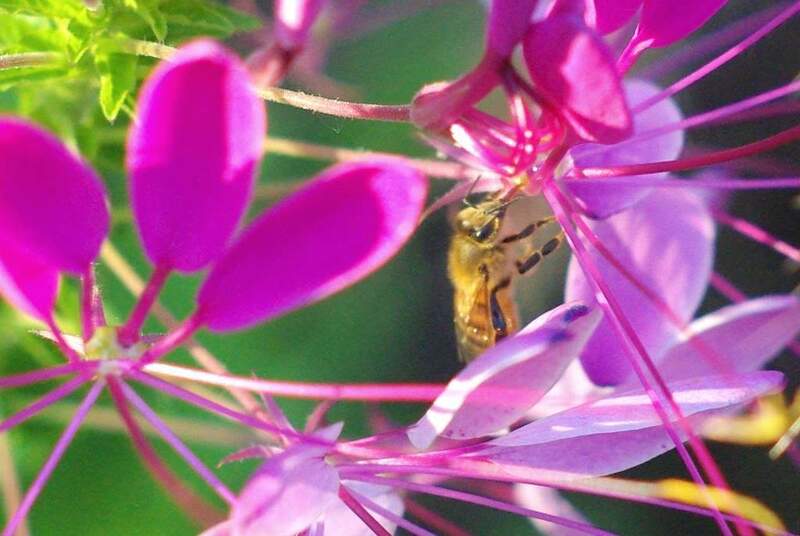 As the Cleome patch was in partial sun, I was waiting for the bees to land on the sunlit blooms, so had a lot of time to observe. 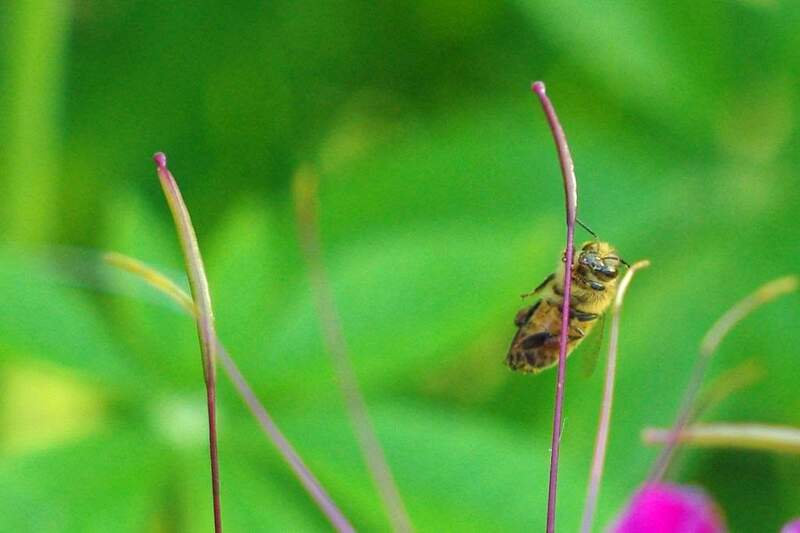 I also saw bees that seemed very confused. 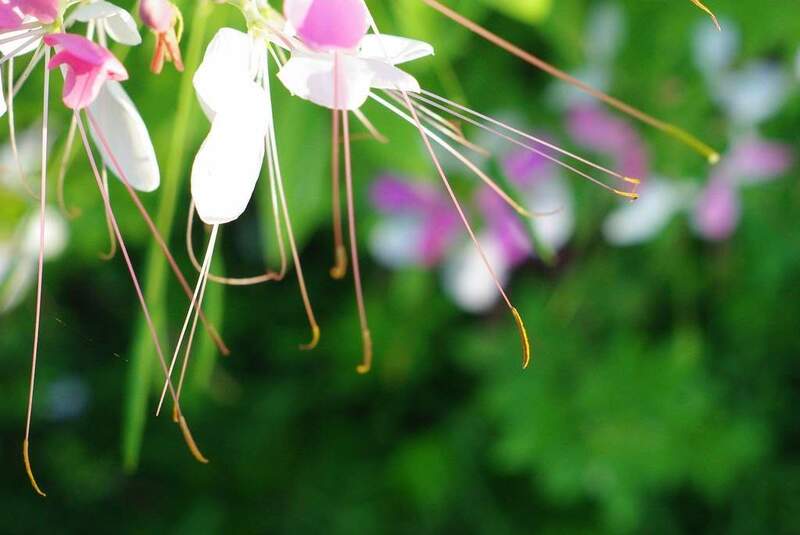 They would land on the really long filaments, dangle there for a moment, then fall off. I thought for sure there was something wrong with these bees. 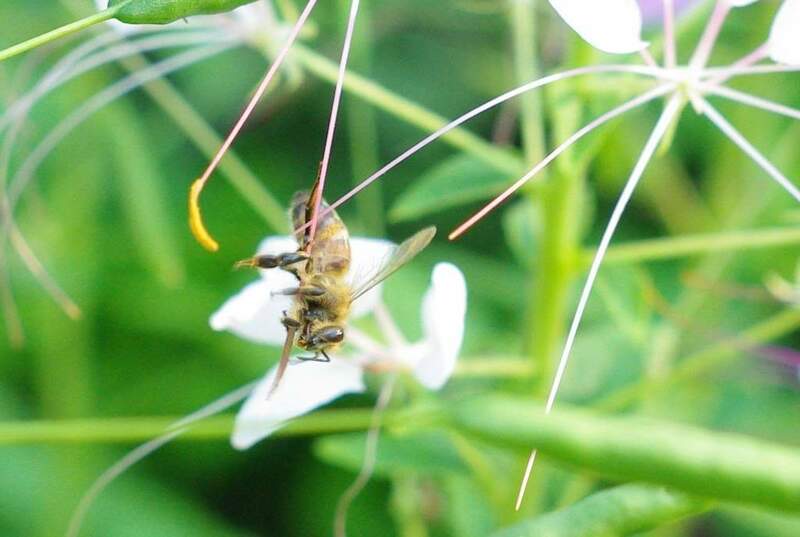 Then I realized what they were doing: they were collecting pollen! I think this one is drinking dew from the leaf. Large drop of nectar. Maybe some dew in there too? So thanks to the shadows of trees, I was "forced" to spend more time watching these flowers than I had planned on this morning, but I learned a bit more about bees. Time well-spent I think! 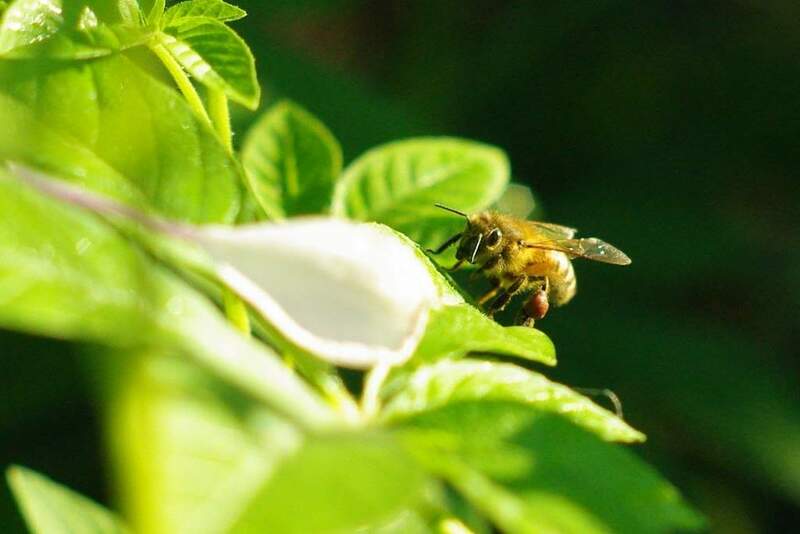 If you really want to learn more about honey bees, check out the Curbstone Valley Farm blog. 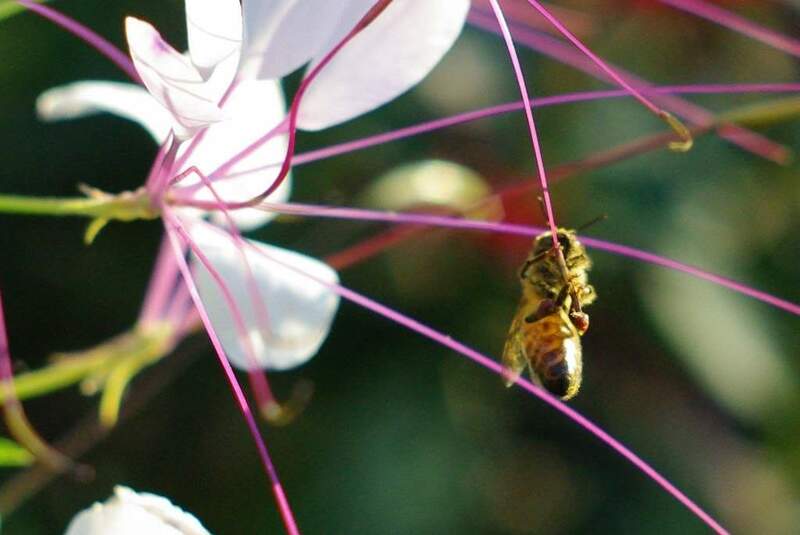 It's a fantastic blog about gardening and beekeeping in California, very well written with beautiful photos. Definitely worth a look! Excellent post. 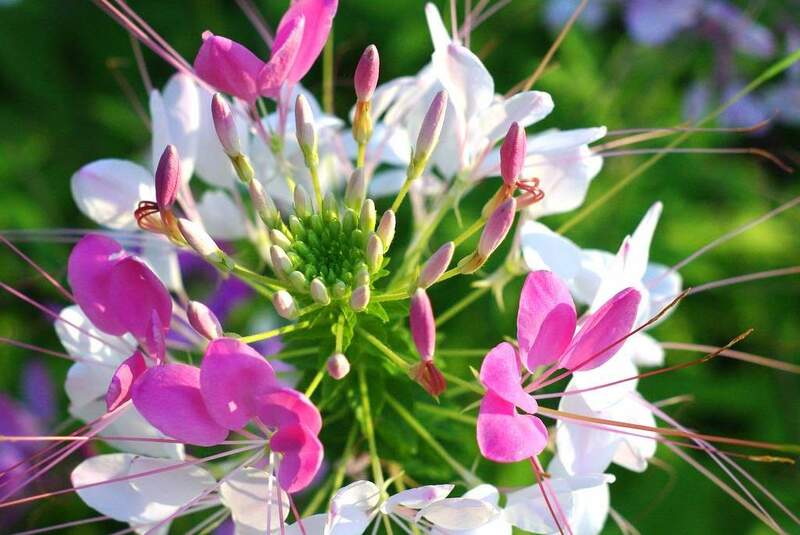 I love the photos of your cleomes. I'd never seen one before. 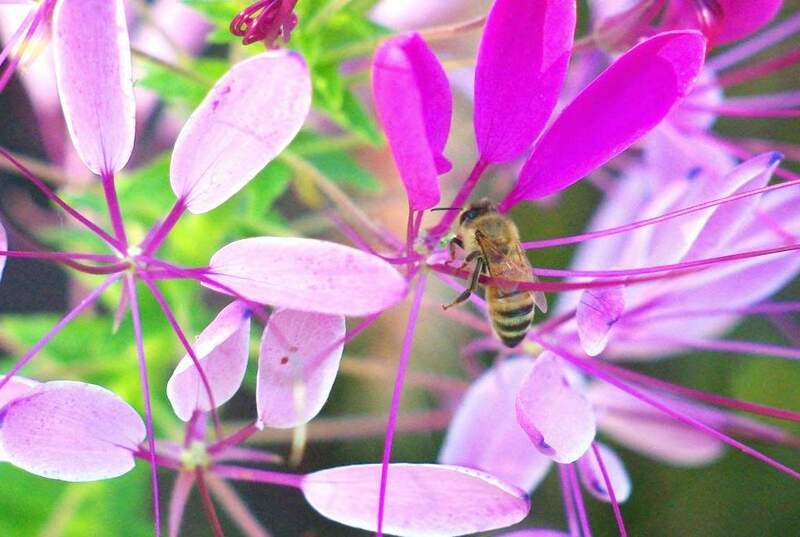 Love the photos of the bees on the Cleome! It looks like they're having so much fun among the filaments. Thanks so much for the shout-out too, very much appreciated! :) When you are you getting your bees Alan? 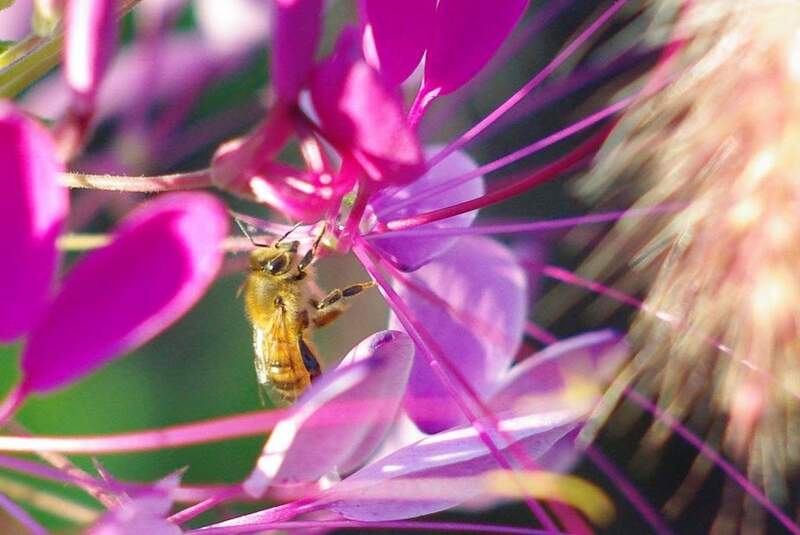 A great post, with incredible photos of the bees. 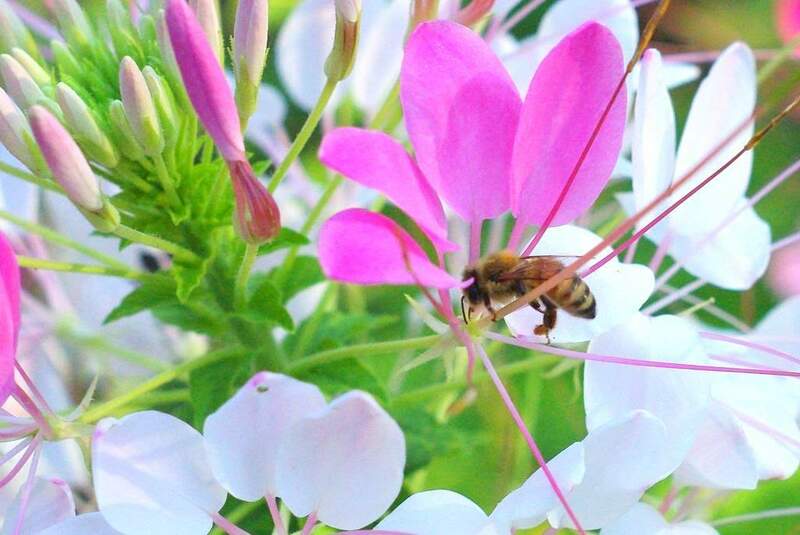 I'm impressed you were able to get such good photos of honeybees because they move so fast! You might be interested in the Great Sunflower Project, where you count the number of bees that come to a flower in 15 minutes and submit the data. I wrote about it today. Super post! I could watch the bees for hours! They are really fascinating creatures. Great pictures and blog! 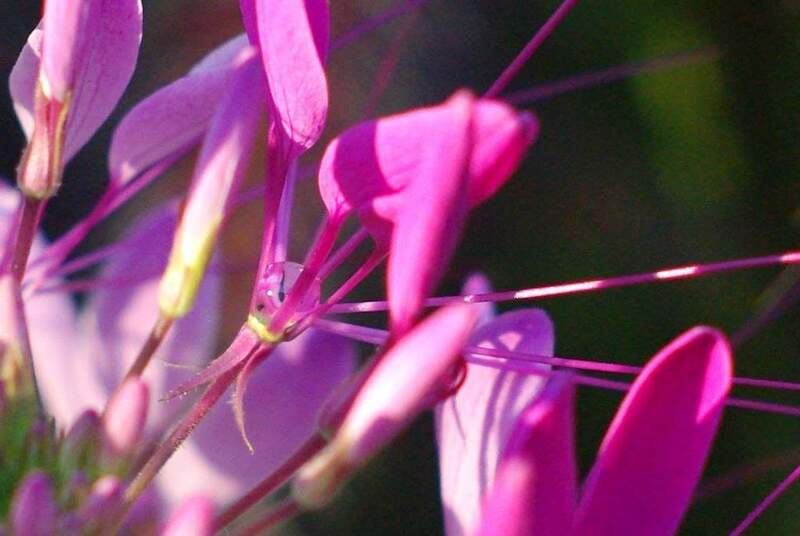 I'm about to plant some cleome for our bees as they are a good source of nectar when other sources are rare. I hope we have as much success with it as you.